PlayEuroMillions is a very promising – but flawed – lottery site. It’s easy to think that they are yet another run-of-the-mill lottery site with nothing new to offer. You’d be wrong though. Like most lotteries, PlayEuroMillions also offer a decent selection of games that include the most popular lotteries, a ton of accepted payment methods and a zero-commission stance. But they also offer a few unique features, such as the various play options that slightly alters how you play. The way they claim prizes on a player’s behalf is also noteworthy – and rare among lottery sites. All good stuff. On the other hand, I’m not too keen on rooting for PlayEuroMillions so easily, as they stumble in several key areas. For starters, players who enjoy playing syndicates, raffles or scratch cards are going to be disappointed; only good ol’ single play games are featured here. Plus, the company doesn’t scan official tickets nor do they offer official lottery entries for all their games (i.e. some games have you simply betting on the outcome). To top it all off, their website isn’t very user-friendly in some areas, which left me a bit disappointed. PlayEuroMillions shows promise though. PlayEuroMillions has been in the business since 1998 and has served countless players from all over the world. They are one of the longest running lottery sites in the industry, offering players the chance to participate in various official lotteries via a safe, secure website. They are owned and operated by Secure View Services Ltd. and is duly licensed by the government of Curacao. Playing on PlayEuroMillions is quite easy – if you manage to get past the website’s slightly un-intuitive layout. Go to the front page and scroll down for the list of lotteries. Choose your game and click on the green “Play Now” button. Go to the main navigation menu, and click on the green “Play Now” button next to the “How to Play” button. You will be taken to a page where all lottery games are listed, and you can quickly choose your numbers. Take note that options are limited – this is intended for quick purchases. Scroll down to the very bottom of the website, where you will see links to all the lottery games. These links will take you to each lottery’s full, dedicated game pages. Pick your numbers – either manually or via Quick Pick. You can also use Quick Pick to automatically choose numbers for multiple entries. Select the draw dates and how many draws you wish to participate in. Click on the green “Add to Cart” button and then the “Checkout” button. Review your purchase and click on “Continue to Payment” once you are satisfied. Complete your purchase once you are done. PlayEuroMillions’ game selection may not be the most varied out there, but they offer some of the most popular games. Yes – PlayEuroMillions does not offer any other game type (like syndicates or raffles) but what you get is pretty decent.The company offers access to big games like the US Powerball, Mega Millions, Euromillions, Super Ena Max, and SuperEnalotto, but they also feature other less-popular games. As a result, you get a good enough mix of games (though certainly not the best out there). There’s a pretty big caveat though: If you come across a game whose posted jackpot on PlayEuroMillions is larger than the official lottery’s, it means that you will be simply betting on the outcome of the game. In other words, your ticket isn’t an “official” entry into the lottery. On one hand, you stand to win an even bigger jackpot (since PlayEuroMillions adds some extra money to entice even more players). On the other, you won’t be an official entrant into the lottery game. They have a pretty good payout record so you will get your prize even if you aren’t officially entered. But wouldn’t you rather be entered to an official lottery game? I know I would. As far as safety is concerned, PlayEuroMillions doesn’t disappoint. First off, they utilize Comodo SSL to secure connections so players won’t have to worry about their transactional details falling into the wrong hands. They also have an active e-gaming license provided by Antillephone N.V., and is authorized by the government of Curacao. Finally, SRC Security Research & Consulting also gave the site a thumbs up, so you can be sure that PlayEuroMillions is a legitimate lottery site. Unlike other lottery sites, PlayEuroMillions claims all prizes on a player’s behalf – including the jackpot. That’s right – you don’t need to travel far to collect your winnings. All prizes, however big or small, are automatically deposited to your account. Smaller wins appear faster in your account, while bigger wins – such as jackpots – take longer. Jackpot winners need only fill out forms that PlayEuroMillions will send. Meanwhile, all winners are notified automatically via email, while jackpot winners will receive a call from one of the website’s agents. They will also set you up with an independent financial adviser to help you out. Banking is one of PlayEuroMillions’ strengths. PlayEuroMillions accepts a good variety of payment methods. Take note that only the supported payment methods in your country will be displayed in your account, so you may not see all of these options when you are depositing. There isn’t as much withdrawal methods as there are deposit options though. Players can simply fill out a short form in order to claim winnings via EFT or bank wire. For certain countries where they don’t have a local bank account, however, PlayEuroMillions may not be able to execute a conventional EFT. In cases like this, they will turn to international bank wire or, if all else fails, simply issue a check. You can also choose NETeller or Skrill as your preferred withdrawal method. I was impressed by PlayEuroMillions’ customer service. On top of a fairly meaty FAQ section, it’s also very easy to get in touch with their support agents if your concern/s cannot be solved by self-help measures. They offer dedicated phone lines for residents of UK, Poland, Sweden, Spain, Argentina, Brazil, France, Romania, Hungary, and Czech Republic. Beyond that, you can also get in touch with them via an online contact form, direct email, and live chat. I tried reaching out to them via live chat, and I was paired up with an agent almost instantly. The agent, Dorshel, was pretty cordial and helpful – and, more importantly, she provided in-depth information about my query. Overall, I was pretty happy with their support. PlayEuroMillions’ education materials are quite good – though not particularly exhaustive compared to some lottery sites. For the most part, they do deliver. Each lottery game page provides just enough information for you to become familiar with each one. For instance, you can learn about a game’s history, mechanics, and prize structure when you visit their respective game pages. 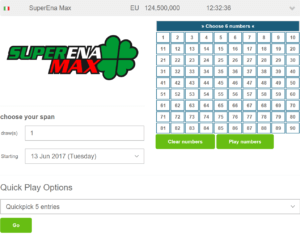 If it’s your first time playing lottery online, you can also find a general “How to Play” article located elsewhere on PlayEuroMillions’ website. That’s all there is though, so don’t expect to find a lotto dictionary or more in-depth comparisons of their games like what other sites do. That’s fine though, since the information provided here is just right. As you’ve probably gleaned earlier on in this article, PlayEuroMillions’ website is a bit of a mixed bag. Don’t get me wrong, their website isn’t exactly a mess. It’s just that some parts are just not as well-thought out as the rest. At first glance, it looks and feels like any other lottery site – but going to the lottery games themselves, as I mentioned earlier, can be a bit confusing. It’s easy to mistake the quick purchase options for PlayEuroMillions’ full, dedicated game pages. They don’t really make the distinction between the two main lottery game pages all that clear. As such, It’s easy to find yourself in their quick purchases page and miss out on all the options available to you in their full dedicated game pages. The “Take a Tour” feature should come in handy for newcomers. Other than that, however, PlayEuroMillions’ website is generally easy to use. 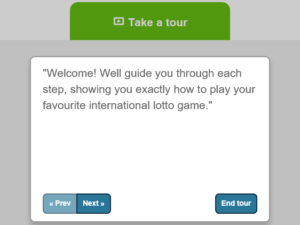 Each lottery game page, for example, sports a “Take a Tour” feature. When activated, small pop-up windows automatically appear, containing brief explanations that teach you how to use their game page. Meanwhile, if you aren’t particularly fluent in English, it’s also good to know that you can switch between 10 other languages. They support languages such as Russian, Polish, Swedish, Portuguese, German, Czech, Romanian, Spanish, French and Magyar. One of the more unique features that PlayEuroMillions offer are their various game options. Rapid Play – This option allows you to play all draws for the lottery of your choosing. You can choose whether to enter all draws in a month, in a week, or your own custom time period. Standard Bundle – This option allows you to purchase bundles that encompass their entire game collection. You can choose to purchase bundles for one or four weeks of play, or for three, six or twelve months’ worth of entries. Super7 Bundle – This option allows you to choose seven lotteries to enter for a week, a month, three months, six months, or an entire year. Big 5 Bundle – This option allows you to purchase a bundle package of the five biggest lotteries, which grants you entry to all draws for over a week, a month, three months, six months, or a year. IntelliPlay – This option allows you to set certain parameters which, if met, automatically submits an entry on your behalf. For example, you can set it so that you only enter whenever a Powerball jackpot rolls over several times. Extra Numbers – This option does exactly as the name suggests: allow you to play up to 3 extra numbers on top of the ones you have already chosen. Definitely check them out as they have a lot of things going for them. Don’t expect perfection though. They may not be able to match the offerings of the top lottery sites – like theLotter or WinTrillions – but PlayEuroMillions is definitely one of the better alternatives out there. I really liked the addition of the different game options – those are pretty unique. I also liked the fact that they accept a ton of payment methods; they don’t charge commissions on winnings; and that they claim all prizes on a player’s behalf. That said, there are several things that they need to iron out before they can even be considered among my top list. For starters, their website layout needs some polishing. It can sometimes become confusing especially when browsing their game list. Beyond that, they really need to consider adding at least group play options. Of course, adding raffles or scratch cards won’t hurt either. Scanning tickets, meanwhile, is also a must in my book. Their alternative works, but having the assurance that you are officially entered into a lottery goes a long way. Speaking of official entries, I’m not a fan of how PlayEuroMillions mixes unofficial games, where you simply bet on the outcome, with official ones. It’s great that they raise the jackpots for unofficial games though, so it evens out. And at the end of the day, it isn’t that big of a deal. Overall, the missteps of PlayEuroMillions aren’t big enough to detract from the entire experience. So, if you can get past their shortcomings, definitely check them out.